Patrice Bardon, VP of Client Services LNG at the Dresser-Rand business, part of Siemens Power & Gas Division, discusses how to select the right driver for LNG liquefaction. "Selecting the right driver for LNG liquefaction"
Because it is both costly and energy-intensive to operate, the liquefaction island of an LNG plant represents an area where substantial savings can be achieved through optimisation and proper equipment selection. The choice of what driver configuration to use for liquefaction is a particularly important decision that needs to be made early in the project development cycle as it has lasting effects throughout the life of an LNG facility. 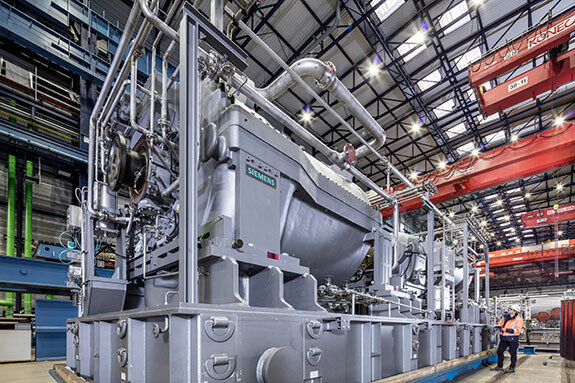 Large Siemens LNG refrigeration compressor. Driver selection impacts the overall performance, efficiency, and profitability of an LNG plant in a number of ways. First and foremost, it determines how much available power there will be to drive refrigerant compressors, which dictates the overall capacity of the train and the facility itself. Secondly, proper selection is essential to achieving project-specific objectives because individual driver configurations present their own unique advantages and trade-offs with regards to CAPEX, OPEX, maintenance, power consumption, emissions, efficiency, and reliability. In general, there are four types of drivers that can be used to drive refrigeration compressors for liquefaction. They are: steam turbines; heavy-duty gas turbines (HDGT); aero derivative gas turbines (ADGT); and variable speed drive (VSD) electric motors. 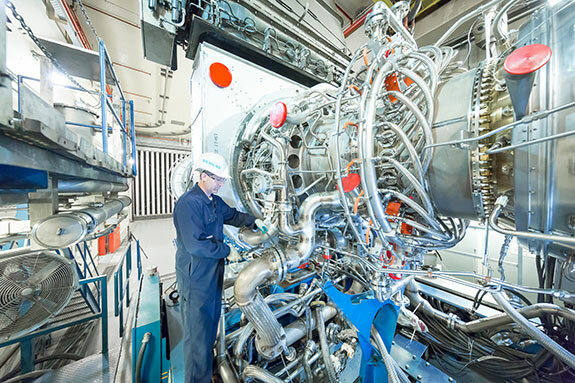 Siemens Industrial Trent 60 aeroderivative gas turbine. It’s important that driver selection and configuration be determined in the earliest possible phase of the project timeline. As the schedule progresses, it will become increasingly difficult and costly to make design changes. Professional scope definition and equipment selection during preliminary design phases will also minimise the likelihood of cost overruns during project execution, installation, and commissioning, as well as when the plant comes online. Collaboration between the EPC, the process licensor, the owner, and the OEMs to optimise configurations can also result in arrangements that achieve efficiency levels much higher than originally considered in the preliminary design. In 2016, the Dresser-Rand business, part of Siemens Power & Gas Division, conducted a study that compared the performance of 10 different driver configurations used for liquefaction. The study evaluated the configurations in nine categories, including CAPEX, OPEX, loss of production due to scheduled shutdown, loss of production due to unscheduled shutdown, fuel consumption, potential for incremental production, emissions (potential CO2 tax), optimised production rate, and total cost (OPEX + CAPEX). Average gas 52.32 MBTU/t of LNG. APC C3 MR process with an assumed power requirement of 0.24 KW per Kg of LNG. Site rating for the turbine 30°C. 120/260 mm H2O inlet exhaust losses for gas turbine performance. 10% turbine ageing and fouling. CAPEX exclude civil work and spare parts. CAPEX includes a dedicated power which is required for all the other utilities in the facility. It is sized based on 10 MW per MTPA of production. 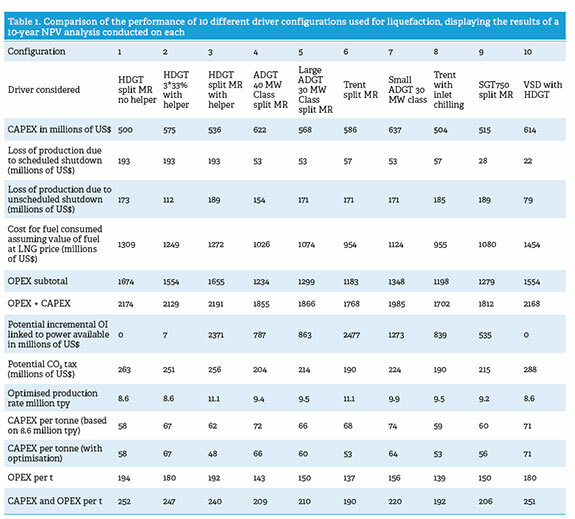 Table 1 below displays the results of a 10-year net present value (NPV) analysis conducted on each driver configuration. It also provides a cost summary per tonne before and after optimising to achieve incremental production. Potential incremental operating income (OI) was calculated by evaluating the value of the incremental sales less the cost of the feed gas and less the cost of the fuel required to achieve that incremental production. Results of a 10-year net present value (NPV) analysis conducted on each driver configuration. In applications where high reliability and low maintenance are important, Configuration 10 (VSD with HDGT) is the ideal choice. If the project is CAPEX-driven, on the other hand, Configuration 1 (HDGT with no helper) may be a more suitable option. Configuration 8 (Industrial Trent Turbine with Inlet Chilling) offers benefits with regards to CAPEX as well, but has significantly lower production losses from scheduled downtime and allows for a 10% increase in production if needed. Configuration 6 (Light Industrial Trent Turbine) offers the lowest combined CAPEX and OPEX and allows for production optimization based on the available power output from the turbines. Configuration 9 (SGT-750) offers comparable benefits to the Industrial Trent Turbine arrangement and is an ideal choice for LNG projects that are both CAPEX- and OPEX-driven. The theme operators can take away from the study is that every individual driver solution has its own merits. Therefore, when designing an LNG facility, the focus should not be on replicating a design from a previous plant or choosing the least costly solution, but rather on selecting the configuration that is most appropriate given the unique objectives of the project.